We wrote last week about how the likes of Argos and John Lewis were building up for Black Friday sales, and also looked at how some sites fell over as a result of the increased traffic. And to give another angle to the Black Friday digital marketing bonanza, I’ve dug around in my inbox to look at the different subject lines and creatives used by retailers on Black Friday. I receive marketing emails from a mixture of UK and US retailers, many of which were offering discounts in the week leading up to Black Friday. 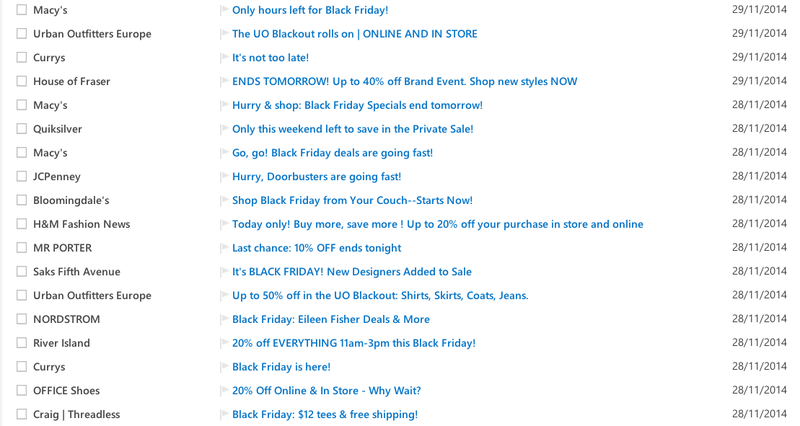 However none of them actually mentioned Black Friday in their email messages until the day before, when the sales began in earnest. 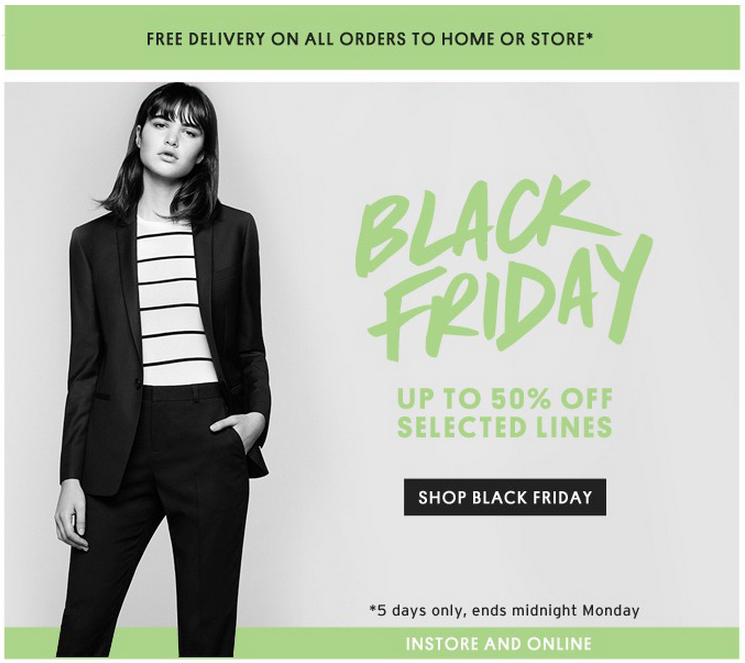 Alongside the likes of Macy’s and JC Penney, UK retailers were keen to get in on the act with Topshop, Urban Outfitters Europe and Quiksilver all sending out emails that specifically referenced Black Friday. It became even more frenzied on Friday with offers galore flooding my inbox. Up to 50% off and free delivery is a powerful incentive to browse Topshop’s Black Friday sale. The creative is simple and has a decent call-to-action so shoppers know what is expected of them. 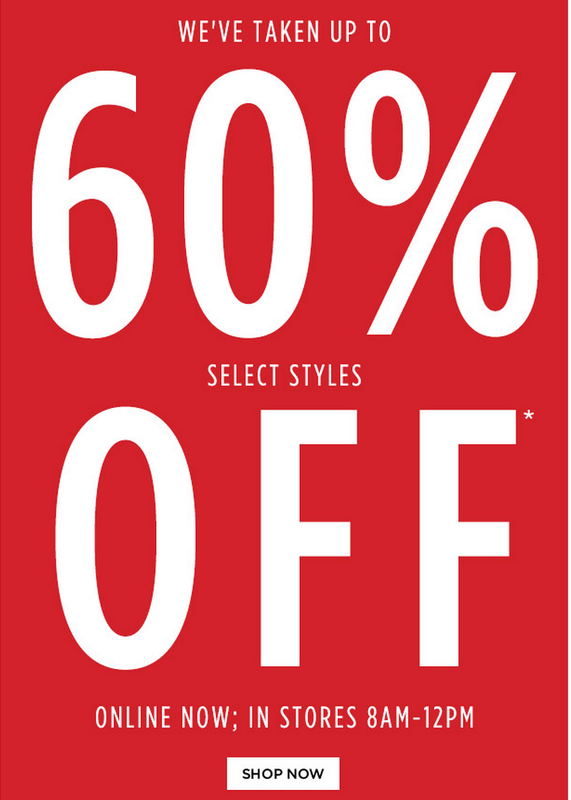 I’ve previously written about Macy’s email strategy, which relies heavily on discounts and offers. Over the course of Thursday and Black Friday Macy’s sent me five emails, each trying to create a sense of urgency around its latest sale. Personally this strikes me as being a bit desperate and could potentially cause recipients to label the emails as spam. The creative is equally unimpressive. 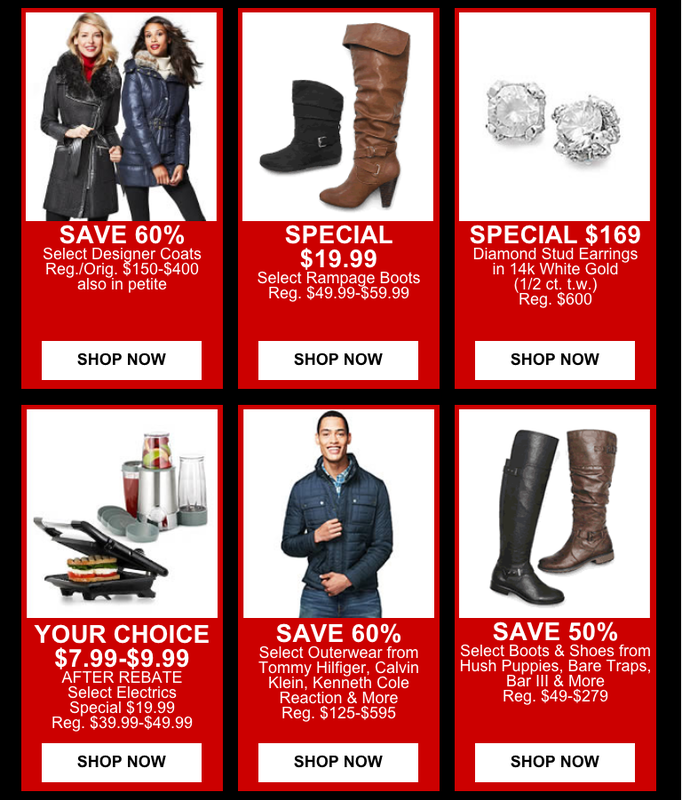 Macy’s has crammed around 20 different offers into this one email, which means it’s difficult to take everything in. 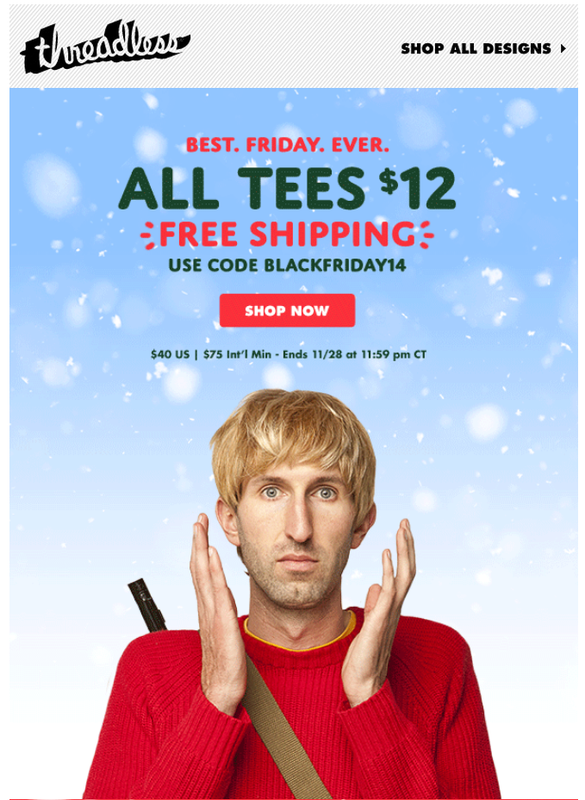 Threadless went with one main offer and it was a good one: $12 t-shirts and free shipping. Admittedly Threadless has an easier task as it has a smaller product range than Macy’s, but the simplicity of the offer means shoppers don’t have to work as hard. There are additional discounts further down the email but prominence is given to the $12 tees. 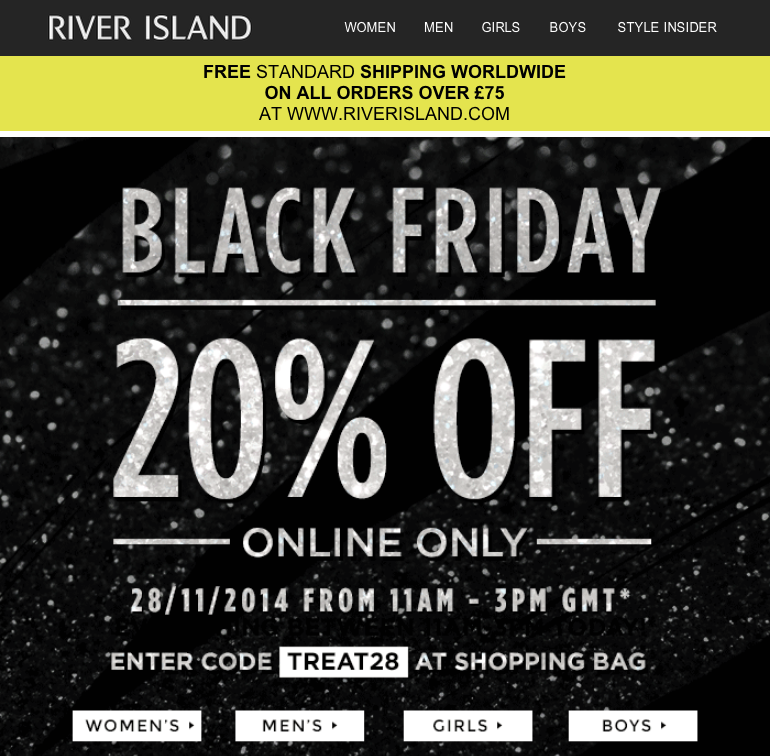 UK retailer River Island put a very limited timeframe on its Black Friday sale (11am to 3pm) presumably as a way of generating a greater sense of urgency among shoppers. The discount was also only available online which is an unusual move for a multichannel retailer. Perhaps it wanted to avoid the ugly scenes seen in other UK stores? The creative is very simple and clearly states the terms of the discount to recipients. Though Saks mentions Black Friday in its subject line the email creative refers to it as a Thanksgiving sale. 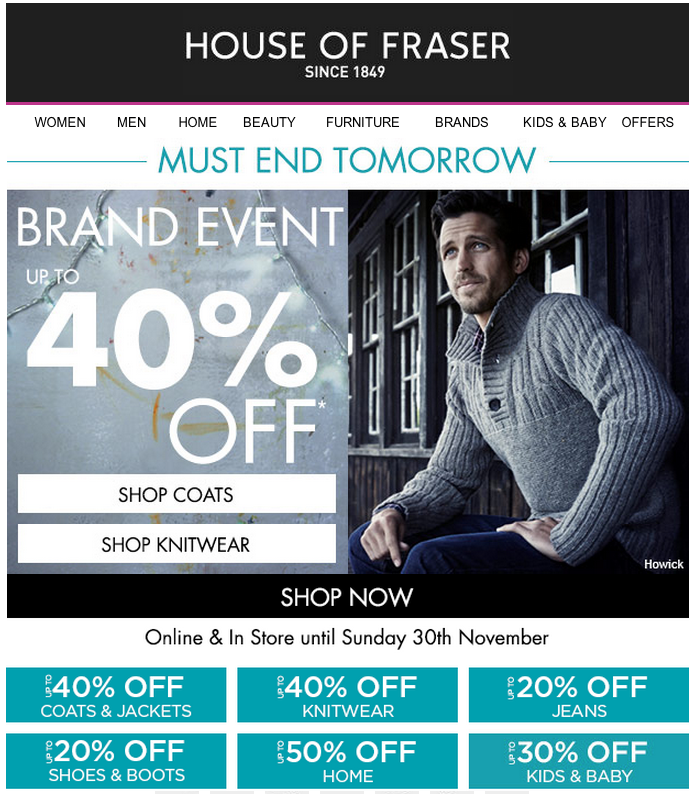 UK department store House of Fraser had a four-day sale that happened to coincide with Black Friday, however it was labelled as a ‘brand event’. The retailer stocks a similar product range to Macy’s but managed to come up with a simple and (in my opinion) more effective email creative. Shoppers can easily see the level of discount on offer and click through to browse the products that are most relevant. Though Nordstrom sent a Black Friday email it stopped short of mentioning the level of discount on offer. 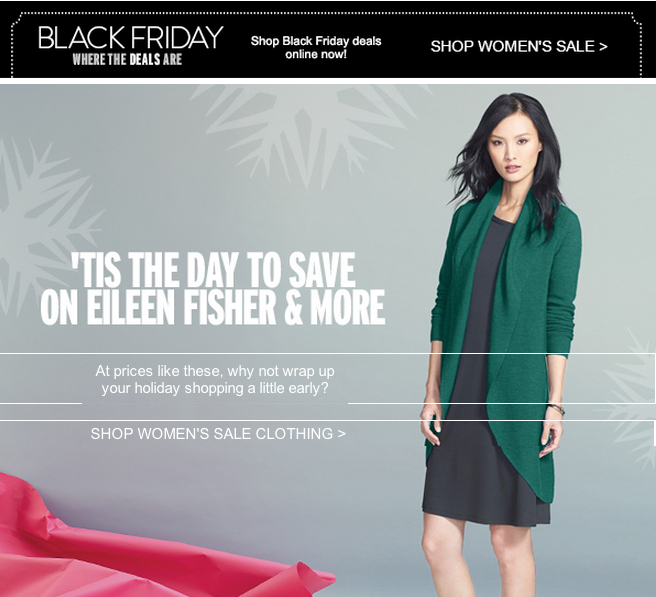 The subject line reads: ‘Black Friday: Eileen Fisher Deals & More’. This is an unusual tactic as it makes the subject line less appealing and relies on the recipient being curious enough to want to investigate the different offers. But on the other hand, it could be that Nordstrom doesn’t want to undermine its brand image by firing out massive discounts like the rest of the riff raff. Another UK retailer hosting a sale that happens to coincide with Black Friday without actually mentioning the day itself. 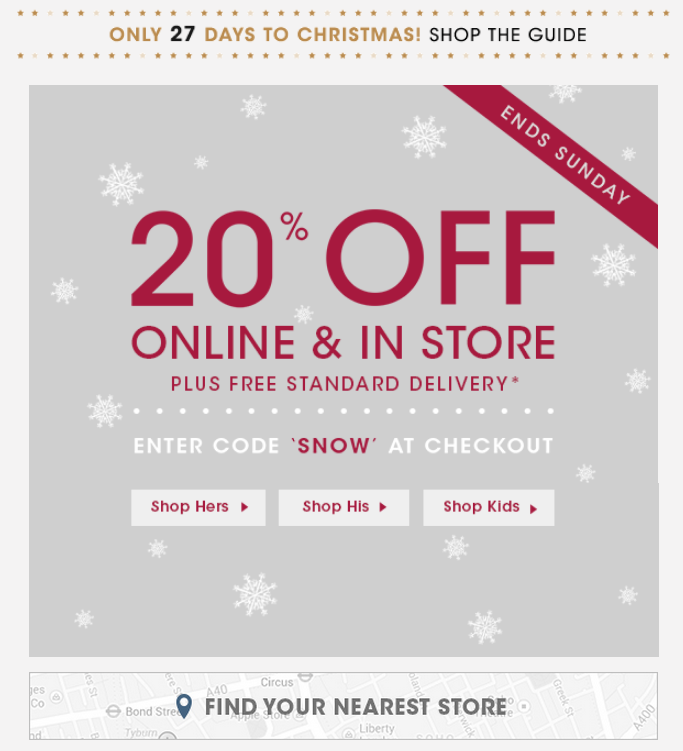 Shoe retailer Office offered customers 20% off plus free delivery. The creative is very simple and I like the fact that it includes a store locator. What’s your unfair content advantage? Every business, if you look hard enough, has an unfair advantage. The trick is to find yours and work it for all its worth. Content: What’s in a name? I’ve written before about the difficulties of the word ‘content’. It’s too often bandied around in discussions that lose sight of its meaning to viewers versus its importance in their strategy. And that blindness is costly. But you quickly find yourself drawing on it because it’s the common reference. Much of the time, that will remain true. Sometimes, however, it’s worth thinking again to see if there’s another descriptor more suitable. Perhaps another descriptor that can focus on a different detail and a different priority and help you concentrate on what matters. For the last few years Sony has been working harder to improve the way it engages with its audience using storytelling techniques. Tim Lion is the European head of social media at Sony and during his talk at last week’s Festival of Marketing he admitted that it would be “a fallacy to suggest that what they were doing was a roaring success”. However finding the right tone and content to connect with an audience is a lengthy process that takes a great deal of trial and error, especially if you’re a brand that’s just used to broadcasting technical specs for the last 70 years to an incumbent audience. Things are improving though, and Lion’s social team seems to be learning from its mistakes.